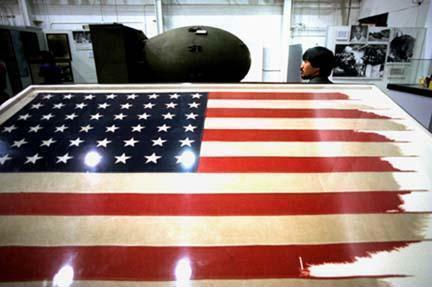 Between the flag that flew at the Trinity Site base camp, tattered from the strong New Mexican winds, and a spare "Fat Man" nuclear bomb casing, Akira Ono of Osaka, Japan, tours the National Atomic Museum in Albuquerque. Ono said he had mixed feelings visiting a museum dedicated to weapons of mass destruction. On July 16, 1945, a brilliant flash in the New Mexico desert changed the world. In the 50 years since history's first atomic explosion, the promises and perils of nuclear science have touched nearly every aspect of our culture and politics. In a special 12-page section marking the anniversary of that first explosion, code-named Trinity, Seattle Times science reporter Bill Dietrich and photographer Alan Berner detailed the history, impacts and future of atomic weapons and nuclear power. This World Wide Web site provides a rich source of information and links for anyone interested in the development of the nuclear age. It will be particularly useful for students and teachers. It uses the text of the special section, for example, as a starting point for further study. In addition, it provides supplementary material to take you deeper into the subject, interactive activities for discussion and debate, and links to other Internet sites specializing in atomic issues. We encourage your feedback to The Seattle Times. Strong feelings: After 50 years, even historians find controversy when they talk about the bomb. A bright side: Radiation provides a weapon for doctors. Nuclear leftovers: What's to be done with all the unused plutonium? Radiation: It's not easy to say how much is too much. Atomic legacy: How much have we tainted earth, wind and water? Note to teachers and students: You will see there are a number of different ways to use this material. We suggest you begin by reading through the main articles from the Trinity special section, then returning to visit any of the hyperlinks marked in those articles that take you to more in-depth information. Check the Interactive section for a special Study Guide, including ways you can learn more about this subject and sharpen your Internet skills at the same time. More information is also available about our Newspapers in Education program.